The CDC releases the latest obesity data and maps, by state and county. All 50 states now have registered a prevalence of at least 20%, and 5 states have an obesity prevalence greater than 35%. The National Academy of Sciences releases its congressionally mandated report: Redesigning the Process for Establishing the Dietary Guidelines for Americans. The Nutrition Coalition, an advocacy organization seeking science-based nutrition guidance, applauds the report and summarizes the findings. On a related note, RealClear Health riffs on the importance of basing nutrition policy on science. CNBC reports on diabetes and prediabetes in America. According to a new CDC report, 33% of American adults have either diabetes or prediabetes—over 100 million people. The vast majority of those with prediabetes are undiagnosed. Diabetic amputations soar in California—up 61% (between 2010 and 2016) in some CA counties. Multiple reasons cited, including health literacy and budget cuts. Read why rocker Mick Jagger “swears by” his keto diet… And keto goes mainstream with this positive feature article in Harper’s Bazaar. Check out how Bollywood celeb, Tanmay Bhat, lost 109kg in 12 months on a keto diet. Or consider whether Tyler Johnson (NHL center) can improve his game & avoid injury with a keto diet. (He and his trainers think so.) Or delve into two case studies that try to answer the question, can a ketogenic diet fight psychosis? Read this New York Times portrait of capitalism run amuck in Brazil, as Big Food looks to the developing world for markets for highly processed food. Can cheese help you fight off cancer? (Here’s what oncologist Dr. Colin Champ looks for at the cheese counter.) Why does the far right love hippie food? Can a woman’s BMI predict her husband’s diabetes risk? Are the “metabolically healthy obese” at greater risk of cardiovascular disease than the “metabolically healthy normal weight” population? Do artificial sweeteners reduce glycemic control? Is the world drowning in grain? Do the bugs in your gut affect your ability to lose weight? Can food banks improve the quality of food offered to their needy customers? What are the best tips for minimizing weight gain during menopause? Plus, why your mother makes you eat dinner before dessert. Gatorade pays $300K settlement in suit over game that discouraged drinking water. Nestlé takes advantage of lax water laws and makes billions. Silly General Mills backtracks—Trix to return to old-school neon colors. Cheerios descends to the ‘dessert for breakfast’ niche with it’s new, indulgent chocolate peanut butter flavor. Grapes bred to taste like spun sugar—Cotton Candy grapes, by Grapery. The FDA delays the required switch to the new Nutrition Facts Label from 2018 to 2020. The power of cake mix in Alaska’s far flung villages. Paris, in butter. Tilt-a-whirl, in butter. Mount Muchmore, in butter. Sriracha butter. Pink herb butter. Chianti butter. Slow cooker butter. 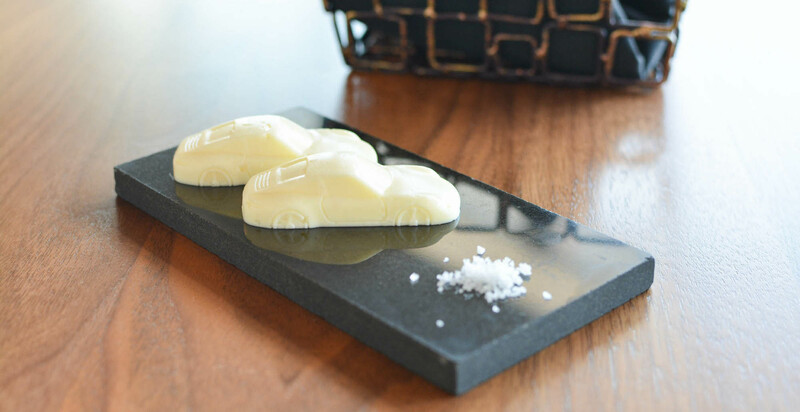 Porsche butter.